In Cement Suitcase, an “anti-romantic” wine comedy, rookie writer/director J. Rick Castañeda abandons the California wine locales we know so well in favor of the less-storied Yakima Valley of Washington. There, we’re introduced to Franklin Roew (played by comedian Dwayne Bartholomew), a successful wine salesman who is slowly losing his girlfriend, his home, and his passion for his job. In the midst of a quarter life crisis, Franklin becomes the reluctant roommate of an eccentric Aussie drifter named Jackford (Nathan Sapsford) and, in a twist both clever and rife with awkward humor, the golfing buddy of his girlfriend’s lover, Brad (Shawn Parsons), whom Franklin has been mildly stalking, and who, inconveniently, actually turns out to be a nice guy. The free spirited Jackford and the clueless yet endearing Brad each have something to offer Franklin in his search for meaning and happiness. But, ultimately, Franklin must learn that he is the only one who can take back control of his life. Cement Suitcase has a refreshing simplicity that belies the heaviness of its title. Clocking in at 93 minutes, the film’s pace is leisurely yet deliberate, pairing well with the Yakima landscape, of which we are given glimpses — of cows chewing grass; of the green hills of Granger, Washington; of endless vines. Having grown up in Yakima himself, Castañeda knows the region and displays the things that make it unique. Liberating the film’s plot from predictability are the clever antics of the Aussie roommate, Jackford (whether it’s roof-sitting or car-diving, one can’t help but think of the show Workaholics when watching him in action). Nathan Sapsford, with his natural Australian accent, does well as a simpleton with flashes of the profound and is truly the most lovable character in the film. Franklin’s only true sanctuary is his car, and we are given several intimate scenes of self-reflective reverie in transit, which succeed in showing the depths of the character. And the cement suitcase experiment itself, which anchors the film at its turn, shows that, indeed, there are depths. In the vein of movies like Waiting and Office Space, Cement Suitcase highlights that life itself, no matter the job, the girl, or financial status, is a simple math of the troubles we all face and the small victories that keep us moving forward. Cement Suitcase is worth seeing. 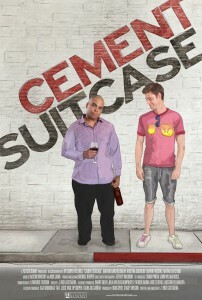 If Sideways earns five stars in the pantheon of wine movies, Cement Suitcase earns three. There is at least one scene of high emotion where Bartholomew is not wholly believable and the audience may have a little trouble accepting that the gorgeous Kristina Guerrero is his girlfriend of three years. Nonetheless, the story is original and well executed. It’s a welcome addition to the relatively small wine comedy niche. It is now available on iTunes and Amazon, with limited screenings in theaters nationwide. The trailer can be seen here and the website here. Eric Annino has two loves: wine and the written word. A former member of the winemaking team at Pennsylvania’s largest winery, he is currently dreaming of his own label and working toward a master’s in English literature at Villanova. Well written. As before I would have given this film no consideration, I will now give it some. This voucher seems well enough for me to spend a night watching “Cement Suitcase” instead of Don Draper’s failing marriage.